Seismic activity at Redoubt has increased since about 13:00 AKDT and is continuing. 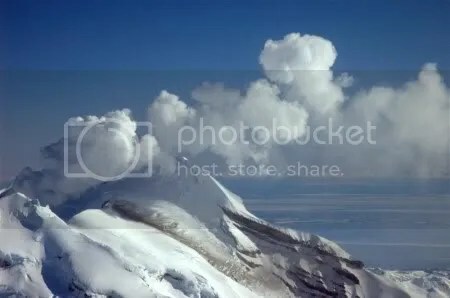 An AVO observation flight reported that a steam and ash plume rose as high as 15,000 ft above sea level and produced minor ash fall on the upper south flank of Redoubt. Last reports are that the plume is now mainly steam. Based on [this] change in activity AVO is increasing the level of concern and alert level to ORANGE/WATCH. It does not appear at this time that a significant eruption is likely in the short term, but conditions may evolve rapidly. AVO is monitoring the situation closely and the AVO operations center in Anchorage is now resuming 24 hour per day staffing. Low level volcanic tremor has occurred continuously over the past two hours. Web camera images are dark. Redoubt has not erupted, but has returned to the level of unrest observed during parts of late January and February. The AVO operations center has resumed 24/7 monitoring of the volcano. The tremor episodes can clearly be seen on the webicorder trace for the RSO station, reproduced below. The first of the two prominent episodes of tremor began at not long after 13:00, tailing off from around 16:00; the second, less intense, increased from about 22:15 and was still ongoing at 00:36. Check out Eruptions (as well as the AVO – and here, of course) for more information and updates. 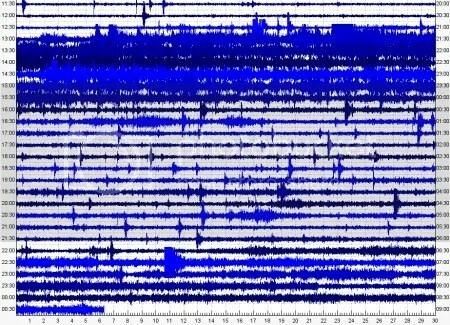 For those interested, yesterday I made a video of the event by combining images from the Hut webcam (automatically downloaded with a script) and sound converted from the seismic trace from RSO seismic station. The video (more like a slideshow with sound, though) starts at about 12:05 (Alaska time) and ends at 18:00, playing speed is 160x of real time. Audio and video are synchronized. Ash/smoke can be seen coming out the summit of the volcano when tremors start.